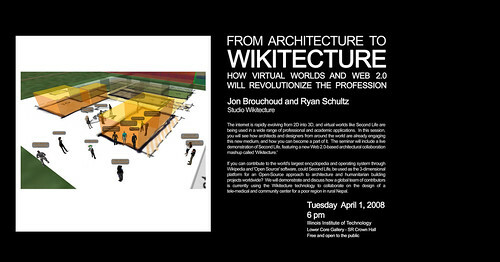 If you happen to be in the Chicago area, Ryan and I will be at the Illinois Institute of Technology on Tuesday, April 1st (6pm Central) talking about Wikitecture, and how virtual worlds and web 2.0 will revolutionize the architecture industry. If you can’t make it to Chicago, you can attend our presentation from wherever you happen to live this Thursday, March 20th at 3pm PDT inside Second Life at the Life 2.0 summit (register HERE). Both events are free and open to the public. Hope to see you there!